If you asked me which small kitchen appliance I wouldn’t want to live without, it’d be my waffle maker. Of course, it’s not the one I couldn’t live without (that would be my food processor), but definitely my favorite part of weekend mornings, and even fun weeknight dinners when I try and waffle just about anything – mashed potatoes, grilled cheese, omelets, fried rice. You name it, I’ve attempted. 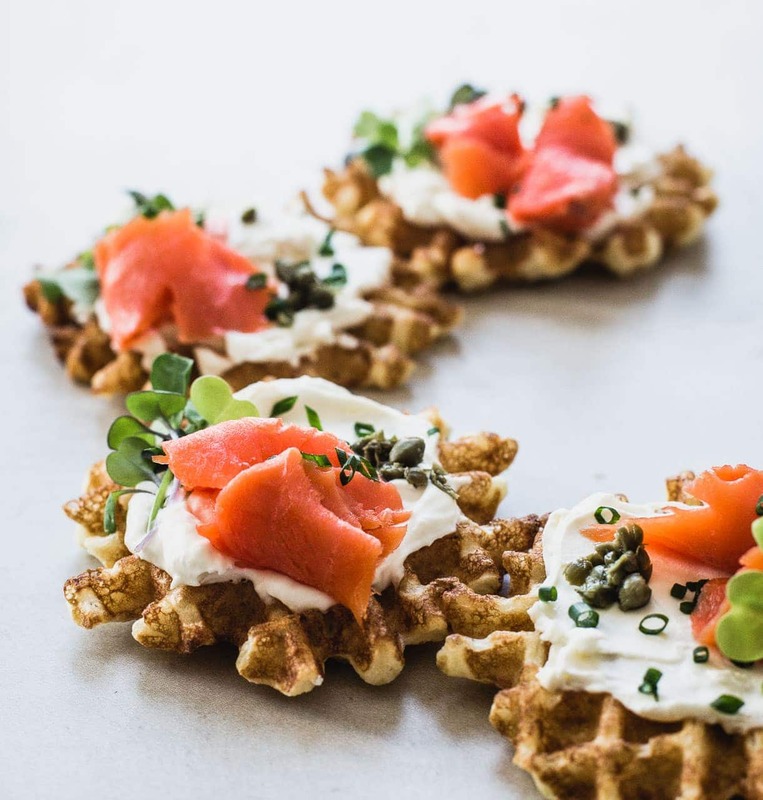 My inspiration for these savory mini waffles came from classic lox and cream cheese bagels, which have been served at brunch decades. Have you noticed that that people often forgo the bagel because they easily dry out, or are just a mediocore carb in some minds? Yep, me too. But served as waffles (! ), they make a fabulous centerpiece for breakfast or exciting appetizer for your next party. 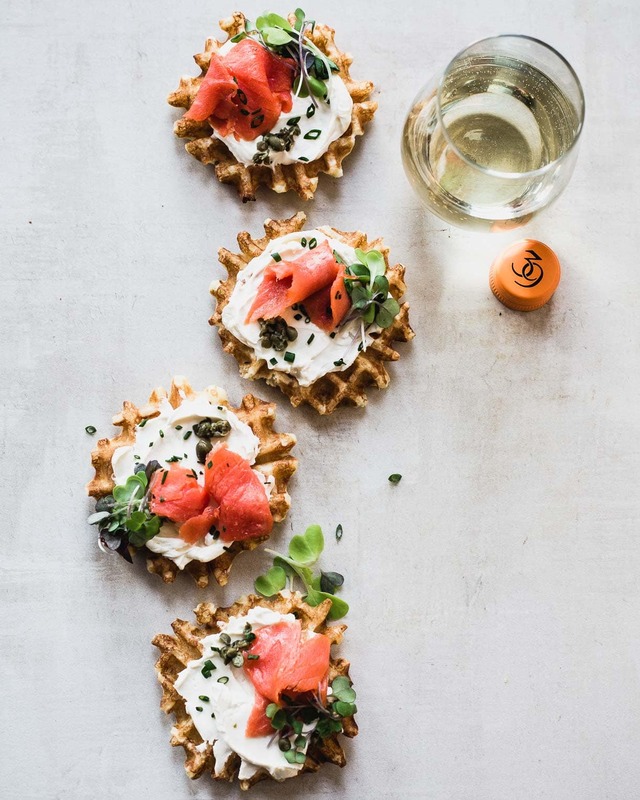 The waffles are based on a relatively standard buttermilk recipe, light and airy on the inside and crisp on the edges, which I developed for a Line 39 Wine project, in which recipes would coordinate with their wines to be attached as bottle tags in the store. Anticipating that all people would have interest in making the waffles, I tested with regular flour, and all purpose gluten-free flour (I prefer Bob’s Red Mill 1 to 1), and the recipe works interchangeably. The mild cream cheese cuts through the smoky salmon, creating a combination that really compliment each other. The sprinkle of capers and chives are essential for their garlicky, salty flavor, and a few sprigs of microgreens brightens the palate. The waffles are paired with Line 39’s Sauvignon Blanc, my favorite of their line. Not as zesty, nor as much minerality as a classic New Zealand style. Made with California grapes, it opens with grapefruit, and finishes soft and clean. There’s no oak or aging, just fresh and bright! My go to for brunch pairings. 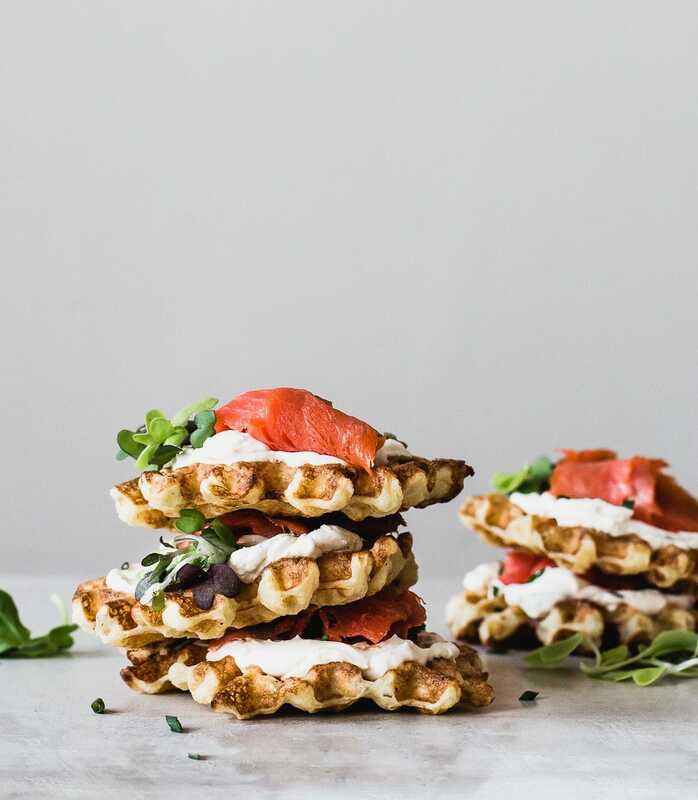 The recipe makes quite a few mini waffles, so invite your friends and have that morning gathering you’ve been talking about. ☺️ And if you make them, share a photo with me on Instagram and tag @heartbeetkitchen. In a bowl, mix together flour, baking powder, salt, black pepper, and garlic powder. In a separate bowl, whisk together eggs, butter, and buttermilk. Slowly add flour mixture to liquid, whisking lightly as you go. You want the mixture to be mostly smooth, but can have a few lumps. Preheat waffle iron. Using 1/8 cup, add waffle mix to the middle of the iron to make mini waffles, and cook per machine instructions. Set on a wire wrack to let them cool. (If they are on a flat surface, they will steam themselves and become soggy.) 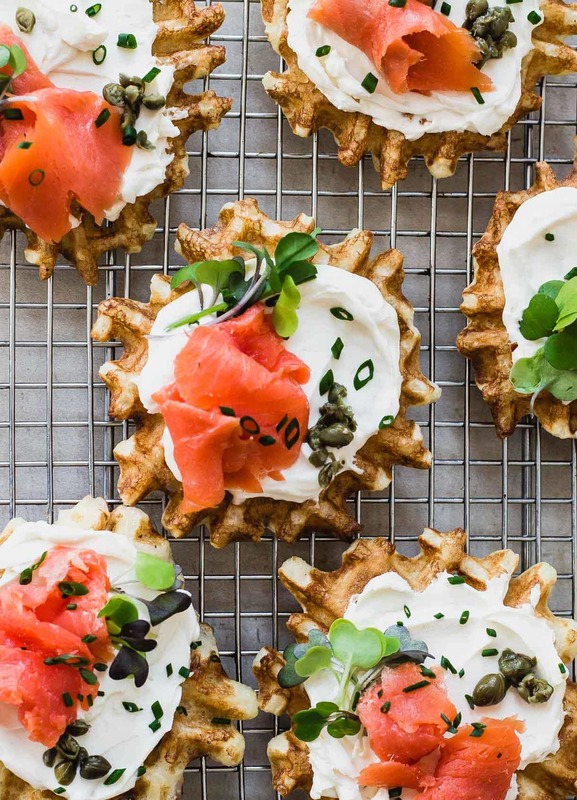 When finished with all waffles, spread 1-2 tablespoons cream cheese on each waffle. Then top with a small piece of rolled salmon, chives, capers, and microgreens. Serve. These are so adorable! What did you use for microgreens? Hi Kalley! I used arugula and broccoli microgreens.